It’s pretty crazy to think that a tiny little egg cooker could amass 7,500 5-star ratings on Amazon, but that’s how good the Dash Rapid Egg Cooker truly is. Pop in up to 6 whole eggs in their shells and press a single button — next thing you know, you’ll have perfectly cooked hard-boiled eggs ready to be eaten, made into egg salad, or whatever else you want. This awesome cooker also makes scrambled eggs, omelets, and more, all with a single press of that same button. It’s worth its weight in gold, but it normally sells for $20. Today, it’s down to just $15.99! 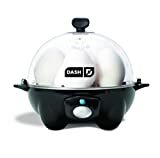 SATISFACTION GUARANTEED: Dash Rapid Egg Cooker is the ORIGINAL (and most trusted) egg cooker on the market, for perfect eggs, your way, EVERY TIME, we guarantee it! VERSATILE: This is the PERFECT appliance for picky eaters, large families, or those who have busy schedules. Hard boiled eggs, soft boiled eggs, poached eggs, scrambled eggs, individual omelets, and all within minutes of the push start button – it couldn’t be easier!